During the night of July 18, 64 AD, fire broke out in the merchant area of the city of Rome. Fanned by summer winds, the flames quickly spread through the dry, wooden structures of the Imperial City. Soon the fire took on a life of its own consuming all in its path for six days and seven nights. When the conflagration finally ran its course it left seventy percent of the city in smoldering ruins. Rumors soon arose accusing the Emperor Nero of ordering the torching of the city and standing on the summit of the Palatine playing his lyre as flames devoured the world around him. These rumors have never been confirmed. In fact, Nero rushed to Rome from his palace in Antium (Anzio) and ran about the city all that first night without his guards directing efforts to quell the blaze. But the rumors persisted and the Emperor looked for a scapegoat. He found it in the Christians, at that time a rather obscure religious sect with a small following in the city. To appease the masses, Nero literally had his victims fed to the lions during giant spectacles held in the city's remaining amphitheater. The historian Tacitus was born in the year 56 or 57 probably in Rome. He was in Rome during the great fire. During his lifetime he wrote a number of histories chronicling the reigns of the early emperors. The following eye witness account comes from his final work The Annals written around the year 116. "...Now started the most terrible and destructive fire which Rome had ever experienced. It began in the Circus, where it adjoins the Palatine and Caelian hills. Breaking out in shops selling inflammable goods, and fanned by the wind, the conflagration instantly grew and swept the whole length of the Circus. There were no walled mansions or temples, or any other obstructions, which could arrest it. First, the fire swept violently over the level spaces. Then it climbed the hills - but returned to ravage the lower ground again. It outstripped every counter-measure. The ancient city's narrow winding streets and irregular blocks encouraged its progress. Terrified, shrieking women, helpless old and young, people intent on their own safety, people unselfishly supporting invalids or waiting for them, fugitives and lingerers alike - all heightened the confusion. When people looked back, menacing flames sprang up before them or outflanked them. When they escaped to a neighboring quarter, the fire followed - even districts believed remote proved to be involved. Finally, with no idea where or what to flee, they crowded on to the country roads, or lay in the fields. Some who had lost everything - even their food for the day - could have escaped, but preferred to die. So did others, who had failed to rescue their loved ones. Nobody dared fight the flames. Attempts to do so were prevented by menacing gangs. Torches, too, were openly thrown in, by men crying that they acted under orders. Perhaps they had received orders. Or they may just have wanted to plunder unhampered. Nero was at Antium. He returned to the city only when the fire was approaching the mansion he had built to link the Gardens of Maecenas to the Palatine. 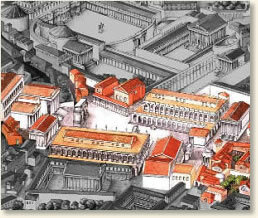 The flames could not be prevented from overwhelming the whole of the Palatine, including his palace. Nevertheless, for the relief of the homeless, fugitive masses he threw open the Field of Mars, including Agrippa's public buildings, and even his own Gardens. Nero also constructed emergency accommodation for the destitute multitude. Food was brought from Ostia and neighboring towns, and the price of corn was cut to less than � sesterce a pound. Yet these measures, for all their popular character, earned no gratitude. For a rumor had spread that, while the city was burning, Nero had gone on his private stage and, comparing modern calamities with ancient, had sung of the destruction of Troy. By the sixth day enormous demolitions had confronted the raging flames with bare ground and open sky, and the fire was finally stamped out at the foot of the Esquiline Hill. But before panic had subsided, or hope revived, flames broke out again in the more open regions of the city. Here there were fewer casualties; but the destruction of temples and pleasure arcades was even worse. This new conflagration caused additional ill-feeling because it started on Tigellinus' estate in the Aemilian district. For people believed that Nero was ambitious to found a new city to be called after himself. Of Rome's fourteen districts only four remained intact. Three were leveled to the ground. The other seven were reduced to a few scorched and mangled ruins." "The Burning of Rome, 64 AD," EyeWitness to History, www.eyewitnesstohistory.com (1999). Nero became Emperor in the year 54 at the age of 16. He quickly distinguished himself by murdering his mother and his wife and establishing a Reign of Terror over Rome. He committed suicide in 68 after the Roman Senate declared him an "enemy of the State." During the reign of the Emperor Trajan, Tacitus was made Governor of Western Anatolia. After discovering a plot against him, Nero vowed to rid Rome of all philosophers. Seneca, his teacher and mentor, was forced to commit suicide in the year 65.